It’s easy to knock the project of to measure the nations well-being – indeed it’s been variously dubbed pointless, a waste of money or an exercise in stating-the-bleeding-obvious whilst there have also been questions about how reliable a measure of well-being asking a person to gave a rating between 0 – 10 is. 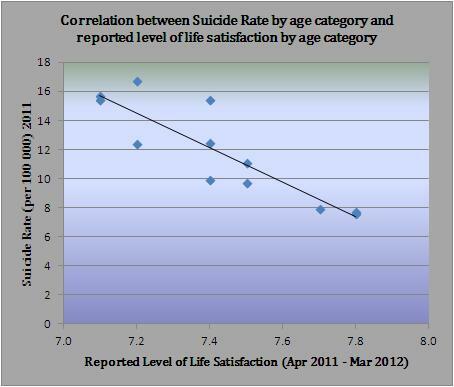 The graph shows what appears to be a strong correlation (R = -0.88) between the suicide rate and reported levels of life-satisfaction when these are organised in age categories. What this suggests is a spectrum of well-being; In terms of age for groups where the overall average level of life satisfaction is lower rates of extreme emotional distress, as indicated by suicide, are correspondingly higher. The importance of well-being therefore cannot be overstated. It’s an age old question; can you buy happiness, or is happiness, or more generally well-being, something which no amount of money can bring. In fact can we even say that money is bad for well-being? The debate infusing years of popular culture, art and literature – whilst Abba Sang that it was “Always sunny/ In the Rich man’s world” F. Scott Fitzgerald’s (1934) novel Tender is the Night highlighted the corrosive effect of money upon individuals well-being through it’s description of the fates which befall it’s super-rich characters. As is the case with James’s super-rich well-being in general has until recently been a rather under-researched area, however the increased recognition that GDP alone is not a sufficient marker of progress has led to a number of statistical organisations to attempt to gauge individuals satisfaction with their lives, in the process making available a range of data for the first time which has been collected using robust methodologies and often, relatively large sample sizes. So can we now answer the question – does money bring happiness, or misery, and not just for the super-rich, but for us all? The first place to look is at the national level. There are vast discrepancies between the wealth of nations, so do people in richer countries on average report higher levels of well-being? Using data from UN Human Development Reports it is possible to plot the relationship between a measure of wealth (in this case GNI per Capita) and reported levels of life satisfaction. 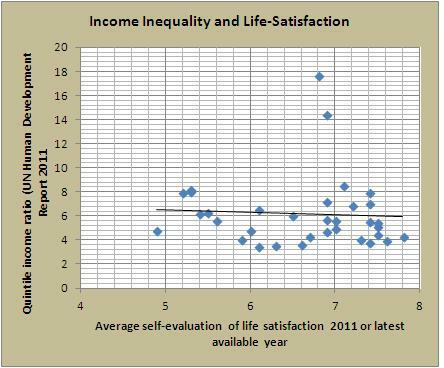 As we can see there appears to be a positive relationship between GNI and life satisfaction levels. Countries with a higher GNI tend to have a higher life-satisfaction rating; Canada for instance with a 2010 GNI of 34 729 has an overall level of life-satisfaction of 7.7, whereas Togo with a GNI of only 789 has a correspondingly lower level of overall life-satisfaction at 2.8. The graph shows however, that at a point very roughly around $35 000 GNI per capita the relatonship breaks-down and that higher levels of GNI are not associated with higher life-satisfaction scores. In following this pattern life-satisfaction seems to conform with a range of other indicators such as life expectancy in which increases in a nations wealth results in improvements in outcomes, however this effect comes to an end when a certain point of development is reached, up until this point increased wealth, enables a greater range of basic needs to be met such as housing and healthcare, but once these are met then there is little role for money in increasing well-being, we must search for other factors. 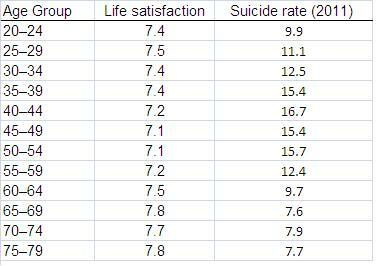 The OECD data on average life satisfaction do however vary within many countries according to social status. The OECD Better Life Index website reports that in the UK for instance the bottom 20% of the British population have an average life satisfaction level of 6.8 whilst the top 20% have a score of 7.2 , and in Estonia the figures are 4.3 and 6.8 respectively. Some recent work carried out by the Office for National Statistics also found that those with the lowest personal incomes reported, on average, the lowest levels of life-satisfaction and lowest scores in response to questions about the extent to which the things they do in life are worthwhile and happiness yesterday as well as recording the highest levels of anxiety compared to other income groups. Generally speaking the scores improve as the income scale rises, with the biggest gains coming between the groups £4160 – £11439 and £11440 – £15 599 though interestingly (especially with regards to Oliver James’s theories in Affluenza) those in the highest income category £49 400 + scored worse in life satisfaction and worthwhile than the category below £39 000 – 49 399, whilst having the same happiness score and anxiety score. It is necessary to mention however, that the ONS point out the data is experimental and comes from a low sample size. 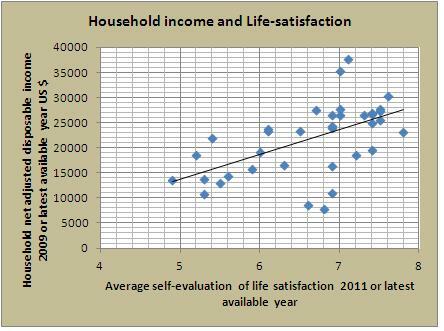 Satisfaction with life increased with household income level. However, the largest increase in life satisfaction occurred between the two lowest household income groups (‘$30,000 or less’ and ‘$30,001– $70,000’), with progressively smaller increases in life satisfaction at higher income groups. You can’t blame players for taking that sort of money if it’s offered, but there comes a time when you have to wonder how much money someone can actually spend? If you are already on £30 000 a week, what else could you buy if you get £40 000? In other words it is not necessarily increases in income per se which increase well-being, rather it is the increase in income relative to the rest of the population. So in terms of the step we have previously mentioned, an increase in life-satisfaction from moving from a household income of under $30 000 NZD to say $45 000 NZD is much likely to be the case when applied to an individual household, rather than all households in that group. One final observation of interest. When comparing areas within the UK there appears to be no relationship between an areas level of wealth and well-being. Most famously, London, the economic powerhouse of the UK, seems to do particularly badly when it comes to indicators of well-being. This is discussed more fully in a previous post, but one possible line of explanation is that the particular economic and social conditions arising from the global city form may be detrimental for well-being. From this short review can we say that money buys happiness? It certainly appears to be the case on both a national level and an individual level that higher incomes are correlated with higher levels of reported well-being. Certainly it seems that being towards the bottom end of the income range is particularly bad for well-being. This appears to have much to do with the income required to provide for basic human needs such as food, warmth, shelter, education and healthcare, or the income required to participate fully in society. Once these have been attained then the effect of income in terms of increasing well-being seems to be less potent, and there is even some limited evidence to suggest that having a very high income is actually detrimental to well-being. Policy implications : To redistribute, or not? The Easterlin paradox is also rather interesting in that it points to a more complex relationship between well-being and income. Raising the overall average level of well-being is not therefore simply a matter of increasing income among the bottom groups, primarily by redistribution, however, according to the paradox this would be rather limited in effect and even any small gains would be counteracted by the losses to well-being incurred by other groups. In addition to lower life satisfaction, people in lower income households were more likely to report feeling unsafe walking alone in their neighbourhood at night and to say they had ‘fair or poor’ health than people in higher income households. It has long been held that low income has been associated with various types of disadvantage; housing, health and education to name a few. It could well be that it is not low income itself which results in low well-being, but these other factors associated with low income. This would explain, in part, why overall rises in average incomes have little impact, compared to individual rises. A rise in the average, whilst improving some material conditions e.g more televisions, has little effect on things such as housing, whereas a rise in an individuals household income may mean the opportunity to move to a better neighbourhood with a better school, or better access to health-care facilities. In other words in developed industrial societies everyone may have a fridge, T.V and mobile phone, but poverty and disadvantage remain entrenched and their effects real. Conducting his own tests addressing these issues and using data from 2006 UN HDR Snowdon finds R₂ =0.026 whilst based on data from 2009 UN HDR R₂ is reported as = 0.0478 (Snowdon 2010 p.28-29). The graph follows Snowdon’s methodology, using the latest available life-expectancy data from 2011 from which it would appear that the observations do not support Wilkinson & Pickett’s suggestion that higher levels of income inequality are associated with lower levels of life expectancy. 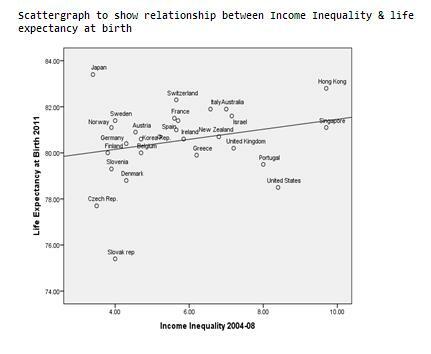 In particular Hong-Kong and Singapore which both have a high GNI per capita, but high levels of inequality also have high life expectancies whilst the Czech and Slovak Republics, towards the lower end of the income range both have lower life expectancies despite having lower levels of income equality- Indeed R₂ = 0.059 with a significance of only 0.214 therefore is neither significant at the 1% nor 5% level. 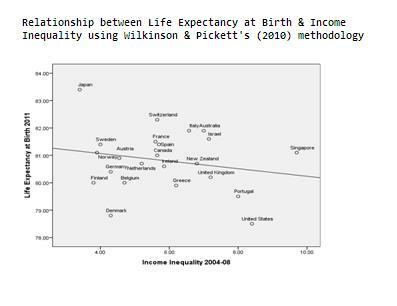 The 2011 life expectancy data, when using either Snowdon’s, or Wilkinson & Pickett’s methodology, do not appear to support claims that there is a strong relationship between income inequality and life expectancy. This is not to say however, that Wilkinson and Pickett’s original assertions were necessarily incorrect. Life expectancy for example is generally increasing, so it may well be that recent improvements in this area have led to the relationship Wilkinson & Pickett observed being eroded. This research was also only carried out on only one aspect of the spirit level thesis and therefore is not applicable to other areas covered by Wilkinson & Pickett, such as crime and obesity.